It seemed particularly fitting in the very same week in which an Italian court took the outrageous decision to convict three Google executives of privacy violations, holding them personally accountable for a video that some teenage thugs had uploaded to YouTube, that Chinese composer Tan Dun should present the Italian première of a piece of music that celebrates all that is wonderful about the Internet and in particular, YouTube – The Internet Symphony "Eroica". Commissioned by Google and YouTube for the YouTube Symphony Orchestra, in which musicians were selected via online auditions and even played the piece virtually via the Internet, it was performed on Saturday afternoon by the Orchestra of the Accademia Nazionale di Santa Cecilia. It's an exhilarating piece, with a clear nod to Beethoven's own Eroica, but with the entirely original and thrilling use of car parts in the percussion section such as clanking drum brakes. 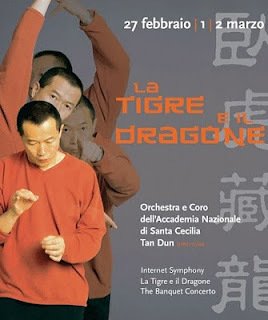 In 2001 Tan Dun won an Oscar for Best Original Score for his soundtrack for Ang Lee's breathtaking Crouching Tiger, Hidden Dragon and the audience were treated to scenes from that film during the performance of another Italian première - a suite based on Crouching Tiger, Hidden Dragon with solo cellist Amedeo Cicchese stepping admirably into the very large shoes of Yo Yo Ma who played the haunting cello part on the original soundtrack. At the start of the second half of the afternoon Tan Dun took time to praise both the Orchestra and the Chorus of the Accademia Nazionale di Santa Cecilia effusively – in fact, the Orchestra were joined on stage by the Chorus for the world première of a suite based on the soundtrack for The Banquet, a Chinese film from 2006 which transposed Shakespeare's Hamlet to ancient China, and where Hamlet is a woman (played by the ubiquitous Zhang Ziyi). The music, he explained, explored the themes of a woman's love, revenge and desire. Originally played by the amazing Lang Lang for the film, for this live performance the talented young Italian pianist Giulio Biddau was the soloist. Closing to rapturous applause after a stunning programme, the audience were treated to a final and completed unexpected surprise and another world first – an encore of The Internet Symphony with full chorus! Tan Dun returns to Santa Cecilia this evening and tomorrow – highly recommended! Watch the original global Internet mash up of The Internet Symphony below or click here to watch it on YouTube.